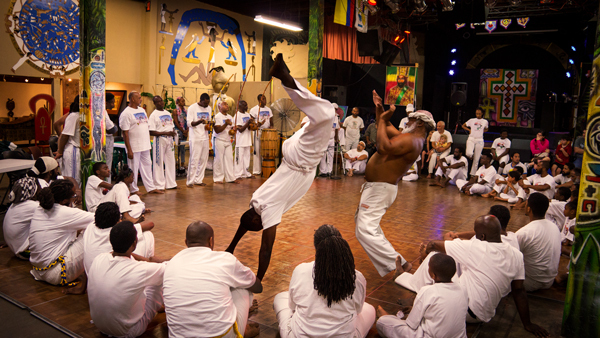 Join us at WorldBeat Center for the 13th Annual Capoeira Initiation and Graduation Ceremony. Capoeira, well known as an African Brazilian Dance/Fight ritual evolved in Brazil during the era of enslavement. The Batisado is an initiation ceremony for the newest students into the Capoeira “Roda” (Circle). Various rituals and traditional Batisado practices are employed during the ceremony. For older students it is a time to receive recognition for their progress and to have the opportunity to play Capoeira with other students from other schools and with other Professors, Contra-Mestres, Mestres and our Mestre (Master), Mestre Preto Velho (Master Old Black) student of the famous Mestre Touro. The Batisado is a celebration of the Capoeira path. When executed by masters, Capoeira represents an explosive, yet gracefully executed series of movements most akin to dance that has as its purpose a game, a philosophy of life, a self defense and triumph in battle. 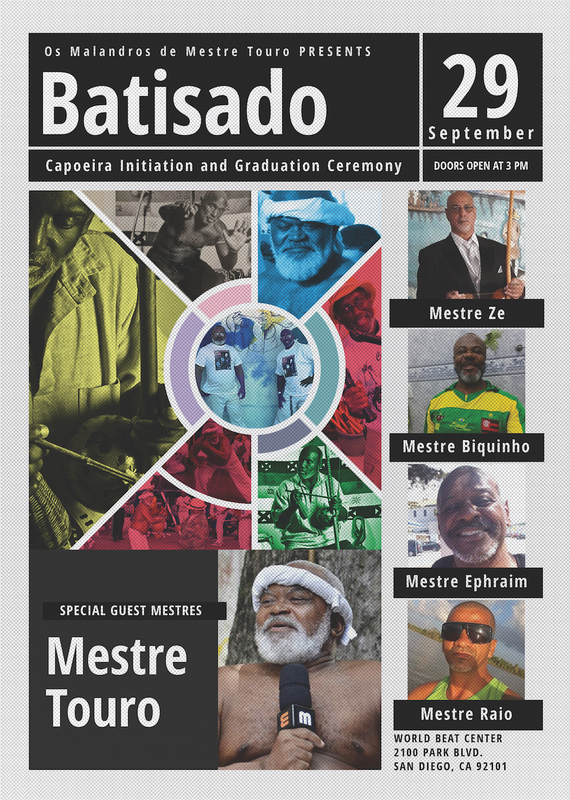 Mestre Preto Velho is the first African born outside of Brazil to hold the title of “Master of Capoeira” in its 500 years of history and will be Graduating a Third Level Master. This title will be bestowed on him by “Grupo Cultural de Capoeira Corda Bamba” de Mestre Touro of Brazil. Mestre Touro is one of only a few Master of Masters of Capoeira in Brazil. Mestre Preto Velho is registered with both the “Liga Carioca de Capoeira” and the “Federation of Capoeira Sport of the State of Rio de Janeiro”. Mestre Preto Velho also has other schools in the U.S. and returns to Brazil periodically to have select students train in the grand tradition of the Brazilian African masters. Mestre Touro, Mestre Ze, Mestre Biquinho, Mestre Ephraim and Mestre Raio, all Grand Masters will be attending! For more information about this event and the art of Capoeira call 619-518-7782.